The Harlem Edge/Cultivating Connections competition that tasked entrants to redesign of a slice of Upper Manhattan's disused waterfront has chosen four winning designs. The Sym’bio’pia, Hudson Exchange, Harlem Harvest, and Stairway to Harlem projects were chosen as the contest's best, each nabbing a cash prize. The winning prize, Sym’bio’pia, was designed by Ting Chin and Yan Wang of Linearscape Architecture. The proposal integrates a series of vertical hydroponic farms with the waterfront community. The plot of land in question, a decommissioned Department of Sanitation marine transfer station located on the Hudson River at 135th Street, has endless possibilities. The contest sought to give Harlem residents a connection to the waterfront, as well as introduce urban agriculture so the community could benefit from fresh produce. The winning Sym’bio’pia’s vertical hydroponic farm is a prototype for waterfront communities in all areas. The towers would be located around community activity areas, like sports fields, farmers markets and park space. The multi-leveled, self-sustaining towers would act as both design and function, luring visitors to the site, while also providing farm fresh food. A path around the area would lead to Nourishing USA’s headquarters, so they could overlook the vertical farms’ production. Grey water would be filtered through the area plants and then used to water the hydroponic gardens, and compost yielded would be used as an energy source for the towers. Second prize went to The Hudson Exchange, designed by SWARM. The team saw the waterfront as a hub for the West Harlem community, bringing businesses and groups of various fields and interest together to create a forward thinking collective. A louvered building would host Nourishing USA, as well as other food networks and a farmers market on the ground level. Utilizing the waterfront, it would act as a literal food exchange, with food barges collecting produce from the on site urban farm and distributing it to neighborhoods along the river. A boardwalk promenade creates a welcome path for the park for people to enjoy the waterfront views. Inside the building, community programming on nutrition, cooking classes, and more would enliven the neighborhood residents. Harlem Harvest by Ryan Doyle, Guido Elgueta and Tyler Caine images a cantilevered glass structure built over the waterfront’s existing pier. A multi-level greenhouse grows produce year round, with the lush greenery visible from the outside. The cantilevered extension juts out above a docking station, providing an area for barges to load produce from the urban farm. The student winner is Daniel Mowry of the University of Virginia, with his Stairway to Harlem project. The proposal connects the existing land with the isolated waterfront, creating a flow of community gardens, vertical greenhouses, markets, educational and cultural areas, and a sustainable shipping port. The vertical famrs would flank grassy knolls for residents to enjoy, small fields of produce like corn would shade the edges of the park area. A man building houses Nourishing USA and a nutritional library, and is covered by a bleacher like louver system that filters sunlight, while giving visitors a sitting area to overlook the river views. Each of these innovative projects combines adaptive reuse with the need to enliven West Harlem with community farming, and thus bringing healthy foods and nutritional programs to the area. 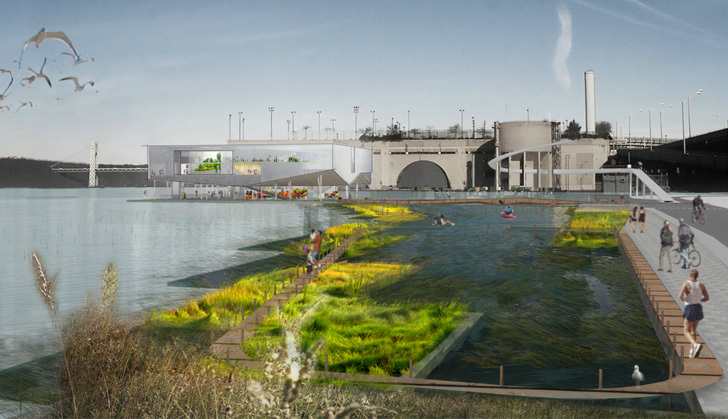 The decommissioned Department of Sanitation marine transfer station has endless possibilities. Located on the Hudson River at 135th Street, the contest sought to give Harlem residents a connection to the waterfront, as well as introduce urban agriculture so the community could benefit from fresh produce. The winning Sym’bio’pia’s vertical hydroponic farm are is a prototype for waterfront communities of all areas. The towers would be located around community activity areas, like sports fields, farmers markets and park space. The multi-leveled, self-sustaining towers would act as both design and function, luring visitors to the site, while also providing farm fresh food. A path around the area would lead to Nourishing NYC’s headquarters, so they could overlook the vertical farms’ production. Grey waters would be filtered through the area plants, and then used to water the hydroponic gardens, and compost yielded would be used as an energy source for the towers. Second prize went to The Hudson Exchange, designed by SWARM. The team saw the waterfront as a hub for the West Harlem community, bringing businesses and groups of various fields and interest together to create a forward thinking collective. A louvered building would host Nourishing USA, as well as other food networks, and a farmers market on the ground level. Utilizing the waterfront, it would act as a literal food exchange, with food barges collecting produce from the on site urban farm and distributing it to neighborhoods along the river. A boardwalk promenade creates a welcome path for the park for people to enjoy the waterfront views. Inside the building, community programming on nutrition, cooking classes and symposiums would enliven the neighborhood residents. Harlem Harvest by Ryan Doyle, Guido Elgueta and Tyler Caine images a cantilevered glass structure build over the waterfront’s existing pier. A multi-level green house grows produce year round, with the lush greenery visible from the outside. The cantilevered extension juts out above a docking station, providing an area for barges to load produce from the urban farm. The student winner is Daniel Mowry of the University of Virginia, with his Stairway to Harlem project. The proposal connects the existing land with the isolated waterfront, creating a flow of community gardens, vertical greenhouses, markets, educational and cultural areas and a sustainable shipping port. The vertical famrs would flank grassy knolls for residents to enjoy, small fields of produce like corn would shade the edges of the park area. A man building houses Nourish NYC and a nutritional library, and is covered by a bleacher like louver system that filters sunlight, while giving visitors a sitting area to overlook the river views.